Romulo Avelica-González, an undocumented immigrant and Los Angeles father who could have been deported to Mexico on Monday, was granted an “emergency stay of removal” by the Board of Immigration Appeals on Monday morning. Avelica-González, 49, will not be deported until the board reviews his case, according to his attorney, Alan Diamante. Avelica-González was arrested in February by Immigration and Customs Enforcement officials after dropping off his 12-year-old daughter, Yuleni, at a Lincoln Heights charter middle school, Academia Avance. Another daughter, Fatima, caught the arrest on her phone, and the video went viral. “This is my country; I have roots and family here. And today I am grateful beyond words that the court has prevented ICE from deporting me,” said Avelica-González at the Adelanto Detention Center in San Bernardino County, according to the statement released by Diamante. Avelica-González emigrated to this country 26 years ago from Nayarit, México. He had a DUI in 2008 and a conviction for receipt of stolen property after getting a faulty vehicle registration. Both misdemeanors were settled in June. “Every day I wake up knowing that I must be at least half as strong as my children have been in their fight for my freedom. I have gained strength from all who have stood alongside me these past months — the most difficult period of my life. I will never give up fighting for my rights, and for the rights of other immigrants,” said Avelica-Gonzáles, father of five children born in the United States. Last week, Los Angeles activists decried as “dangerous” new support by the Trump Administration for slashing legal immigration, as federal officials announced that up to 16 people were arrested in Los Angeles during raids targeting undocumented youth in cities across the nation. “Our district is dealing with the aftermath of having ICE raids in our community. 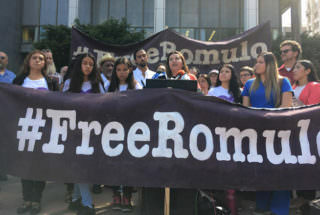 Not only is Romulo’s family living with fear, stress, and anxiety, but so is everyone else who has followed this case,” Los Angeles City Councilmember Gil Cedillo said in the statement. LA Unified is preparing to launch a “We are one LAUSD” campaign in support of immigrant families in Los Angeles. In the school district, roughly 1 in 4 students is undocumented or has a parent who is undocumented.